Should I buy iPhoto for iOS? I was impressed with the level of detail and sophistication that the first version of iPhoto for iOS demonstrates. Aside from being drop-dead gorgeous with swift animated operation, it’s not just another pretty face. It’s deep, complete, has a huge number of functions, and is easy to use. Admittedly, because of the smaller screen, it’s more awkward to use the app on the iPhone, and Apple has tried to accommodate the small screen issues. But in the end it comes down to whether the company wanted a universal app or not. Clearly, it did, and it decided to have the same level of capability in both. Don’t expect iPhoto for iOS to do everything that Photoshop or Aperture can do, but it does do a surprising number of things extremely well. Regardless of how many photo apps you now have running on your iPad, I recommend giving Apple’s new product a try. You won’t regret spending that latte money on the app. And I anticipate that most people will wind up turning to iPhoto for iOS as their default mobile photo editor, perhaps using other apps to fill in special effects here and there. 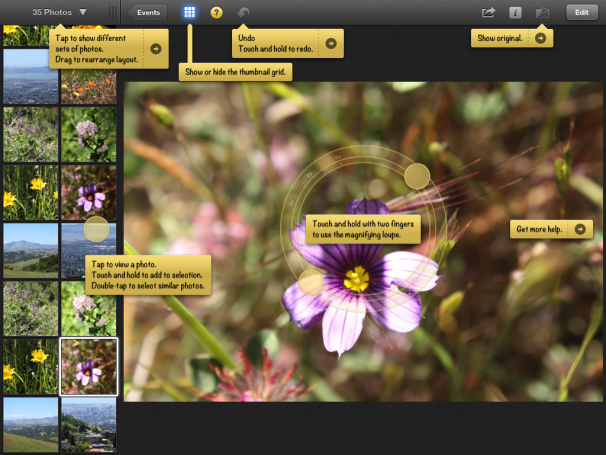 With the unveiling of iPhoto for iOS, Apple provided the missing link in the company’s lineup of iLife mobile software. 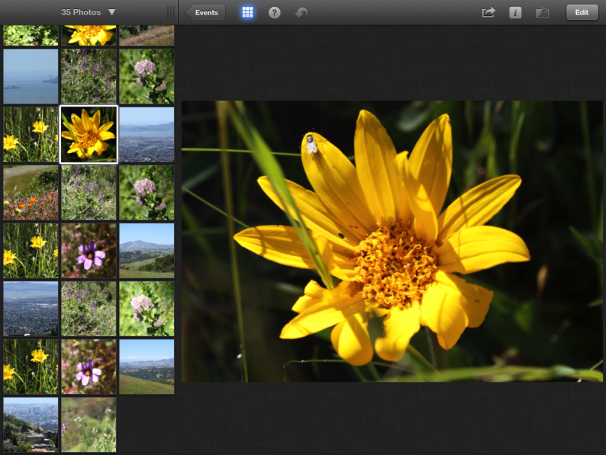 Two years after it introduced the iPad, Apple has released a version of iPhoto made especially for mobile devices. The new app is a full-service viewing, editing, and sharing tool for both the iPad and the iPhone. This review covers the original version of iPhoto for iOS. 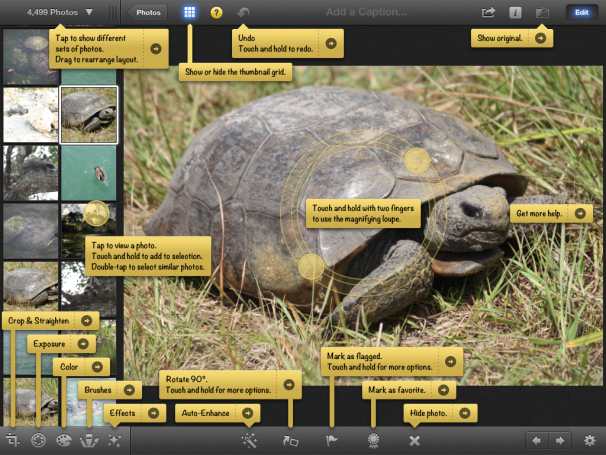 For the latest version, see our iPhoto for iOS version 20 review. In the interim, literally dozens of other app developers created photo-related apps—exposure adjustment and cropping here, special effects and filters there. Now, Apple has built and polished its own interpretation of the ultimate photo app for its iOS devices. The result is iPhoto for iOS, and it is worth the wait. The beauty of iPhoto for iOS is that, at its core, it’s iPhoto by different means—very easy to learn and use, while retaining and simplifying the desktop application’s best attributes. It does not match the Mac program feature-for-feature, but its overall functionality is so similar, that users of the desktop version will instantly recognize the app’s conventions and parameters and what it can accomplish. The program works on the iPad 2 or later and the iPhone 4 or later, but disappointingly, not on the iPod touch—not even one with a built-in camera. Each mobile version feature is distinctly tailored for the device you’re using. The iPad and iPhone interfaces are similar but not identical, and the subtle variations between the two versions work in the user’s favor. That’s because the differences between the phone and the tablet programs relate exclusively to screen size. Almost every function available on the iPad version is present on the phone—except two: The magnifying Loupe and the Coaching Tips. The Loupe tool, called on to enlarge discrete parts of an image on the iPad, is not present on the iPhone. Coaching Tips—labels that identify each of the tools and functions—work well on the tablet, but like the Loupe, would overwhelm the small phone screen. iPhoto for iOS opens up to a clean neutral gray background with four tabs at the top: Albums, Photos, Events, and Journals. Various albums—using a bound-book metaphor—sit atop glass-like shelves. They are color coded to give a visual cue of where the images within them were derived (say, from syncing with iTunes, or from your Camera Roll or Photo Stream), and what edits, stars, or flags you applied to them. This is the first thing you see when you launch iPhoto for iOS. Delving into each tab brings you to major parts of the main interface. You can view photos in one-, two-, or three-column grids on either the right- or left-hand side of the screen. To remove the grid and see only the photo you want to work with, just tap the grid. The viewer with a three-column photo grid is the second thing you see. You can adjust the number of photo columns, or remove the grid completely. 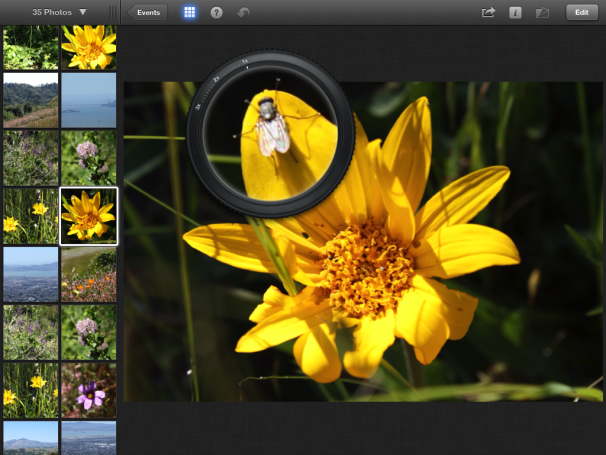 iPhoto for iOS offers a multitude of features that will delight amateur and hobbyist photographers. Like its namesake on the Mac, the mobile version of iPhoto does not pretend to be a professional program. It targets consumers who shoot photos and want simple editing tools to improve those photos. The app also appeals to users who want to organize their images into enticing collections and share photos, be it through prints, digital albums, or social media. There are tools and controls for non-destructive cropping and straightening, fixing exposure and color, and for applying special effects. An Auto-Enhance button, just like the one in the desktop version, is a one-stop-shop. Maintenance tasks, such as flag, favorite, and hide photo, are all there, too. Image resolution is optimized for the iPhone or iPad, which automatically reduces the resolution of photos synced via iTunes from most DSLRs. So what might have originally been a 12-megapixel image shot with your camera will arrive on your device as a 3-megapixel image in iPhoto for iOS. That’s acceptable for some people, especially for online viewing. But, if you want the program to edit your images at full resolution, you must import them directly from your camera card via Apple’s Camera Connection Kit. 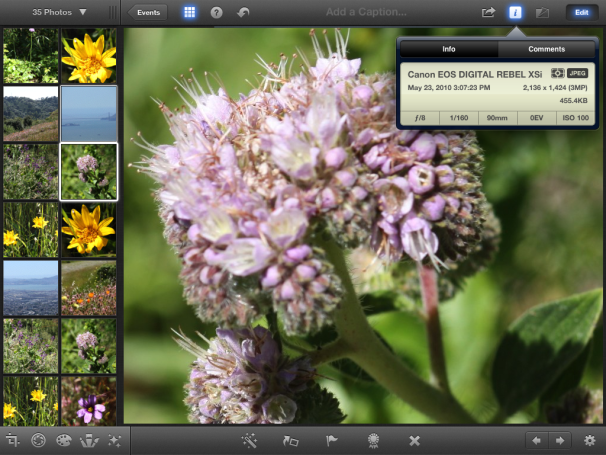 Like iPhoto for the Mac, iPhoto for iOS accommodates images of up to 19 megapixels. It does not edit Raw photos, however. Because this image was imported via iTunes sync, it is optimized for the iPad rather than full resolution. The only way to get a full resolution image into iPhoto for iOS is to import it directly from the Camera Connection Kit. The iPhoto for iOS interface is intuitive, with all actions accomplished on the tablet or phone via Apple’s multi-touch gestures. If you’re familiar with onscreen iOS conventions, the on-screen tap, pinch, and swipe actions will come as second nature. It took me less than 15 minutes to access each of the app’s many features and controls and figure out how they worked—without a glance at the written documentation. The app is driven by unlabeled icons at the top and bottom of the screen with a large Viewer in the middle. This might look intimidating at first. However one of those icons, a circle with a question mark inside it, serves up a screen full of contextual coaching tips that explain the operation of each control. In default mode, you see general tips. In Edit mode, you see tips that relate to editing controls. If you’re in one of the editing controls—say, Exposure—you’ll see only tips related to Exposure. ...while general program coaching tips are different from those shown in Edit mode. As you tap on each of the individual controls—Crop & Straighten, Exposure, Color, Brushes, and Effects—additional animations give visual clues as to how to proceed. The Brushes animation is especially nice: when you tap on it, eight specifically labeled brushes spring up from the bottom menu. Choosing one of those lets you use your finger to brush edits onto your picture. The right side of the screen has a contextual Gear icon that gives you additional controls related to the tool you’re currently using and lets you revert to the original. Every control that is live, in use, or currently applied glows blue. There’s a Show Original and an Undo/Redo button, as well as a function that lets you add edits non-destructively to a view of the image, while some brush effects are saved and temporarily hidden. This allows for experimentation and additional edits without having to revert to the original. You can view up to 12 images side-by-side by tapping and dragging them into the viewer. To remove them from the viewer, just tap, hold, and swipe down. The program’s image-matching technology lets you find similarly composed images in your album or event. Just double tap on a photo in the grid, and all similar ones will appear in the viewer. A double tap lets you view your image pixel-for-pixel at full resolution. There’s even a way to batch edit. In the gear menu, click the button labeled Copy Exposure, Color and Effect, select a group of photos, and use the Paste Exposure, Color and Effect button located in the same place. The formal Help documentation, accessible only through the Question icon, was reasonably complete, though it would have been nice to be able to view, and even flip through it, while you have the app onscreen. As with most sophisticated apps, there are several ways to see and do the same thing in iPhoto. Because of that, iPhoto for iOS avoids the pitfalls of some apps that are easy to use but limited in scope and function. For example, if you have never used a histogram and you do not want to know what that is, you can still achieve the same edit of your image as you would if you were aware that the Exposure slider effectively acts as a histogram. But if you do know that, you will be able to intuit the edit you want more quickly by using the slider to adjust levels the same way you can in iPhoto’s Adjust panel. Tapping directly on the image sometimes brings up on-screen touch controls that correspond to the slider in the menu. For example, the Color control features a menu consisting of Saturation, Blue Skies, Greenery, Skin Tones, and White Balance. You can slide the controls with your fingers to apply changes to a specific part of the image, or you can use the menu controls to adjust the entire image. The color module gives you several sets of sliders to increase saturation, enhance greens and blues, and preserve human skin color. 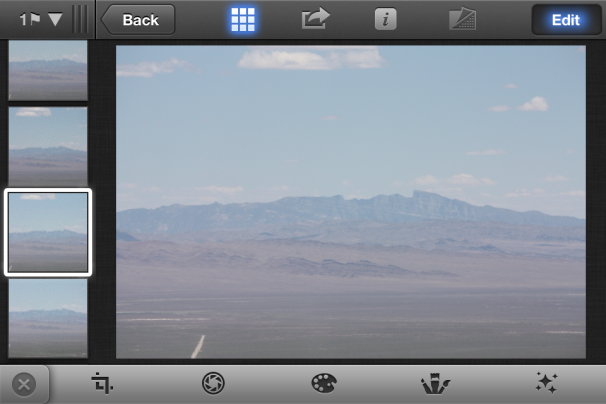 You can also touch the screen instead of the slider to color correct your photo. iPhoto for iOS has multiple options for sharing photos and albums, and all of them are available via the Share button. The button opens into a pane containing the ten choices you have to show your images or albums to others, including the major social networking tools like Flickr, Twitter, and Facebook. You can also email and print your images, create a slideshow with music that’s built into the app, or send photos directly to iTunes on your computer wirelessly or through a wired connection. You can also wirelessly beam your images from one iOS device to another on a shared Wi-Fi connection (or via Bluetooth), and they’ll show up in the other device’s camera roll. All these functions worked well in my testing. Be sure that both devices have both Wireless Beaming and Include Photo Location on, and are running iPhoto for iOS in the foreground. 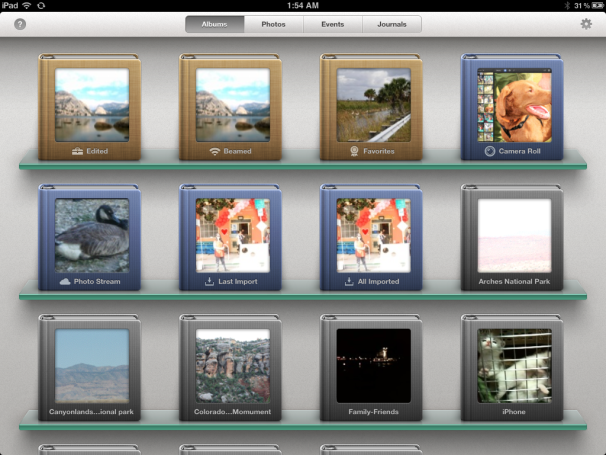 iPhoto for iOS introduces Journals, a way to share groups of photos with friends and family via the Web. The Journal utility is easy to use and gives you some basic layout options. Just choose the images you want to include, choose one of six built-in themes, and tap Create Journal. The program creates the journal and then lets you edit it with Story Elements—little widget-like items that add interest and context to the presentation. You can drag and drop the images into different slots, add headlines and captions and other text, notes, weather, location, and more. While you can change the size of the photos, you can’t change the size of the Story Elements. You can then post your Journal via iCloud and publish it to what Apple calls a Home Page, a Web page with a private URL where friends and family can view your journals. Journals are a snap to make and can look very nice, if somewhat modest. Your mileage may vary, but my Journal of 20 photos took about 4 minutes to build and another 3 minutes to arrive on iCloud. 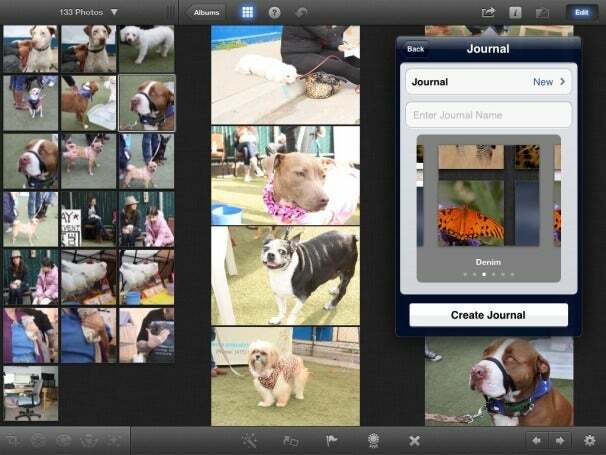 A Journal is a quick and easy way to share an event or group of photos online. While a double tap brings an image to its full resolution in the viewer (pixel for pixel), you can also magnify your images to see tiny details. Two fingers pressed on an image brings up a Loupe (on the iPad only) which lets you magnify a small portion up to three times. Placing your fingers in the “glass” part of the loupe and twisting clockwise with your thumb and forefinger magnifies it even further. Twisting thumb and forefinger inside the Loupe’s ‘glass’ can magnify that part of the image by 3x. The program has an Auto Horizon Detection feature that helps you correct poorly angled shots. It looks for straight lines in an image and alerts you if it detects that the landscape is tilted. Tap on the pop-up dial for the wheel to turn blue to signal that you’ve enabled the device’s gyroscope. Use the wheel to straighten the image, and then hit the Lock Aspect Ration button to so you can crop or do other edits to the photo. A Skin Tones slider that lets you color balance photos based on skin tone is built into the Color module. A Preserve Skin Tones control lets you continue to work with saturation and color corrections without distorting flesh tones. This worked well in testing. The Effects module operates on a beautiful fan metaphor that offers all the program’s effects in an easy-to-see animation. Artistic, Vintage, Aura, Black & White, Duotone, and Warm & Cool each have up to nine different effects that you can tap and choose or slide to adjust. Using iPhoto for iOS on the iPhone is as easy or difficult as doing anything else that involves finger tapping and swiping on a small screen. The program does a creditable job of translating the controls on the iPad onto the phone. While icon-based interfaces are rarely optimal, the same exploratory sequence I went through above offers the same results on the phone. Amazingly, all of the complex features work equally in miniature form, and are easy to follow once you have the concept down. Here’s an iPhoto on the iPhone image ready to edit. For all of its worthy attributes, iPhoto for iOS will disappoint some people. First, it does not work on an iPod touch. So anyone who bought a touch for the content creation and viewing will sadly lose out on this excellent software. Similarly, those who bought the first generaton iPad will not be able to use iPhoto. Almost every time I edited an image, the app paused to update the iPhoto library in the form of a dialog box and progress bar. Sometimes that progress bar took as long as 10 seconds to complete, and within minutes, it would appear again. This sometimes happens in the midst of an operation, and that got annoying. The program’s artistic effects are very nice, but some, such as the Oil Paint and Watercolor effects, are not adjustable: You can keep the effect, copy it, or remove it. The opening clean look is appealing, but I wish were were some way to customize the interface. Right now, iPhoto rules user interaction with their images. I’d like to see more flexibility and customization of the major interface items such as the arrangement and order of the albums, the content of the albums and events, and the background colors, so users can set up the program with visual cues that are meaningful to them. Syncing, organizing, and deleting photos from various albums and events can get unwieldy. That’s because these management tasks are based where the photo was derived and what you did with it in the program. With iPhoto for iOS, you may be able to immediately hide an image, but you will not be able to directly delete it if you synced it from your iTunes library or altered it in the app. If you took an image with your device, you have to go to the Camera Roll to delete it. If you derived it by syncing to your computer, you have to remove it via your computer, or uncheck it in iTunes before resyncing with your device. You can’t rearrange images in albums or events either, or change their order of appearance on screen. 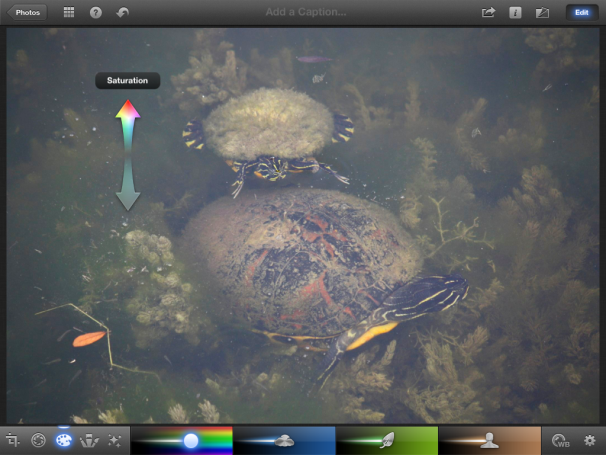 The iTunes album I synced with, for example, has several images of aquatic turtles scattered throughout, but I cannot group them together via drag and drop in iPhoto for iOS. And unless you are syncing identical sets of photos from your iPhone and iPad, do not expect your libraries to look the same across your devices. Content is device specific, with the exception of Photo Stream via iCloud.